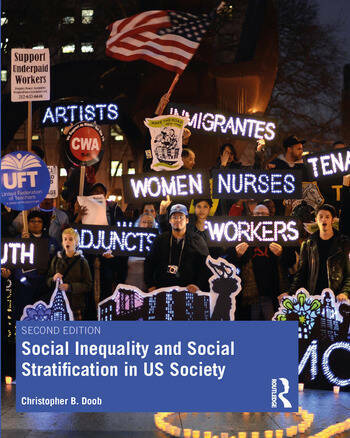 Social Inequality and Social Stratification in US Society uses a historical and conceptual framework to explain social stratification and social inequality. The historical scope gives context to each issue discussed and allows the reader to understand how each topic has evolved over the course of American history. The author uses qualitative data to help explain socioeconomic issues and connect related topics. Each chapter examines major concepts, so readers can see how an individual’s success in stratified settings often relies heavily on their access to valued resources—types of capital which involve finances, schooling, social networking, and cultural competence. Analyzing the impact of capital types throughout the text helps map out the prospects for individuals, families, and also classes to maintain or alter their position in social-stratification systems. Christopher B. Doob is Professor Emeritus of Sociology at Southern Connecticut State University. His published works include Sociology: An Introduction, 6th Edition (Harcourt Press 1999); Social Inequality and Social Stratification in US Society (Routledge 2012); Race, Ethnicity, and the Urban American Mainstream (Pearson 2004); Racism: An American Cauldron, 3rd Edition (Pearson 1998), the second edition of which received a Myers Center Award for the Study of Human Rights; and Great Expectations: The Sociology of Survival and Success in Team Sports (Routledge 2018). In addition, he has been active in his community, serving as coordinator for the Southern Connecticut State University's Urban Initiatives, which established math tutoring classes for inner-city children. He has also participated in the struggle for welfare rights and been a long-time volunteer in two local adult-education programs.